What skill sets do you look for in distributor sales teams? How do you set the terms of the relationships? What motivates distributor sales reps? And how can you and your products and services stand out in this environment? 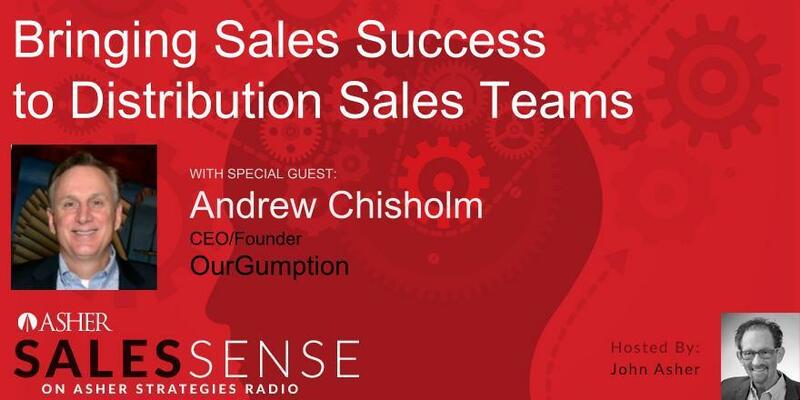 Find out the answers to these questions and more from Andrew Chisholm, CEO and Founder of OurGumption, on the November 29th Asher Sales Sense podcast: ‘Bringing Sales Success to Distribution Sales Teams. Andrew Chisholm’s highly successful 35-year career in service, sales, marketing and executive leadership is driven by a passion for emerging, innovative technologies, as well as the ability to creatively influence and drive colleagues, channel partners and customers toward mutual understanding and meaningful growth. He possesses an innate talent for motivating, developing, and leading top-performing sales teams, in addition to an uncompromising work ethic, unwavering integrity, creativity and the ability to build strong relationships with all stakeholders.